Peel and chop the red onion and stir it in a bowl with BBQ sauce, sesame oil and a dash of water. Marinade the salmon filet in it for a couple of hours. You can very well leave it in the marinade over night. If you're short on time you can try roasting it without waiting time. As the salmon will roast slowly in the oven that might suffice. Cut a piece of baking paper into shape (you want to wrap the salmon in it completely) and place the marinated salmon on it. Set the remaining marinade aside, we'll need it later. Wrap the salmon in the baking paper like a bonbon and tie it up on both sides. Roast the salmon at 80°C (176°F) for about 40 – 45 minutes. 15 minutes before the end you can add the bagels to the griddle. Take the salmon out of the oven and add it to a bowl. With a fork pull it apart and mix it with the remaining marinade. Halve and slice the avocado. Mince the chives. 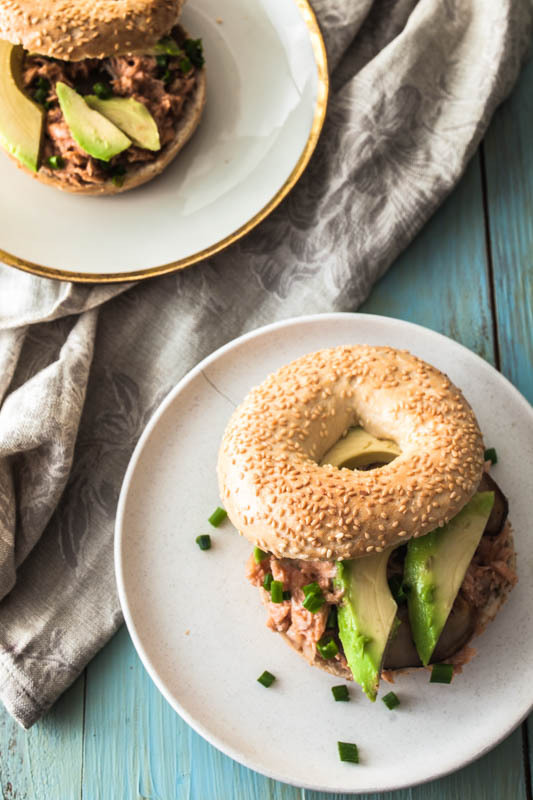 Halve the bagel and spread the pulled salmon evenly. Add the avocado slices on top and drizzle some chives over it. Optionally you can spread the upper half of the bagel with more BBQ sauce. Best served when still warm.